When it comes to choosing accommodation, it’s good to think outside the box… actually sometimes it’s good to just think outside! I’ve put together my ultimate list of coolest open-air hostels from around the world, for when you’ve gone full backpacker and the idea of living under a roof seems like an unnecessary constraint. Get ready to check out from society and check in to one of these laid-back retreats. Nestled away in the Sierra Nevada mountains high above the quiet town of Minca sits the secluded Casa Loma. Backpackers brave enough to make the steep climb are rewarded with unobstructed 360-degree jungle views, with the ocean and the nearby city of Santa Marta visible in the distance. A range of accommodation options from tents to private cabins are offered, but my personal recommendation is the simple hammock and mosquito net under the stars – as long as you don’t mind being woken up by rowdy toucans! Group yoga sessions take place each morning, and there’s also a bar/communal area where a family style vegetarian dinner is served every night. The island of Gili Air may not be considered as wild as its more famous sibling, but there’s always a party going on at Begadang, home of the world’s first mushroom shaped swimming pool. Begadang is like a laid-back, backpackers commune that welcomes you as family the minute you walk through the door – if it had doors, that is. Be prepared to get back to basics; sleeping in straw huts, taking bamboo showers and going to the toilet outside. After a few Bintangs in the sun with new friends (both human and feline), civilisation will be a distant memory. You know all those hours you’ve wasted trying to choose between staying in a hostel or going to circus school? Well that dilemma is solved forever my friends! At Pai Circus School you can learn some impressive new party tricks, dance all night around a fire pit or swim all day in an infinity pool, all whilst surrounded by a stunning mountain range in Northern Thailand. This is the hostel you never knew you needed! It’s also a major social hub for the small town of Pai, so you’ll be bonding with new friends over a set of juggling balls in no time. The Dreamer can stand up against the swankiest of five-star resorts in my humble opinion. Its main attraction is its huge swimming pool, which you can laze around all day if you don’t feel like taking the few short steps to the beach – considered one of the most stunning in Colombia. There’s a party at the bar every night, and all sorts of activities take place on the grass every morning, from yoga to Spanish lessons. Accommodation is indoors, with the choice of cabin dorms or super luxurious private rooms. Everything else is wide open – in fact, you might end up sharing your dinner with the neighbour’s dogs! Pack your tent; you’re not gonna’ want to miss the legendary pool parties at this dreamy Queensland retreat. Step outside each morning to glistening turquoise seas and calming island sounds – and prepare for this to all be forgotten when the sunsets and the DJ gets fired up. BASE is somewhat (in)famous for being the wildest hostel on the island, a reputation that’s regularly upheld with their ‘Full Moon Down Under’ rave, a take on the iconic Thai party that brings a crowd of 5000 revellers to Magnetic Island once a month. This kitschy, quirky little site is made up of brightly coloured caravans and trailers that have been converted into dorms and private rooms, as well as having an outdoor bar, BBQ area and hammock zone. It’s just outside the hustle and bustle of the city, so you’ll have no problem relaxing by the tranquil lake. When you do want to hit up the ‘Dam there’s a free shuttle bus on standby to whisk you into the city. Kadir is something of a veteran in the hostel game, having been scooping awards since 1999 and showing no sign of stopping any time soon. Here you can reclaim your childhood fantasy of living in a tree house… just with way more booze instead of marshmallows for sleepover snacks. Hangover permitting, they also offer lots of adventure activities including paragliding, white water rafting and scuba diving. And for the less *ahem* active amongst us, its live music nights, incredible food and unbeatable location on Turkey’s Mediterranean coast make it a winner too. Slap bang in the middle of an idyllic island is where you’ll find this backpacker favourite. Accommodation options are varied, but it’s pretty hard to beat falling asleep in a private tent to the sound of waves crashing. The sand is the place to be; whether you feel like sipping cocktails at the beach bar, trying your hand at volleyball or just lazing on a hammock with a coconut in hand. Look up paradise in the dictionary – I’m pretty sure you’ll be redirected here. This charmingly authentic hostel aims to replicate the culture of a traditional Khmer village through communal living, with just a few contemporary luxuries to make your stay more comfortable. Nestled on the river bank in a forest of mango trees, the pace of life here is refreshingly slow; you can swim, fish, cycle and take a much needed break from partying along the backpacker trail. Relax in your private bungalow, just don’t be alarmed if a monkey joins you in the shower – they’re friendly enough! The post Hostelling Al Fresco – Where to Find the Coolest Open-Air Hostels in the World! 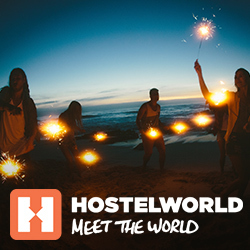 appeared first on Hostelworld Blog.